Don't be fooled by the simplicity of these pieces of kielbasa wrapped in bacon and lovingly glazed with a mixture of brown sugar and beer with pepper flake heat. Pop a few in your mouth and you'll say wow! Of course I use my original, one of a kind rub (order the recipes) to give these a massive kick of flavor that won't stop until the cows come home! 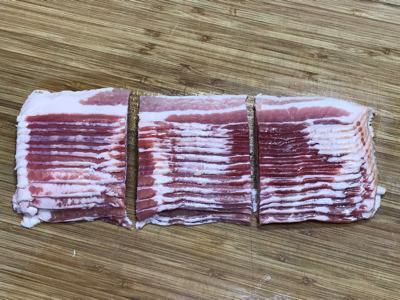 1 lb of bacon, cut into thirds. The kielbasa I purchased had 2 links per package and I ended up getting about 14 pieces of kielbasa per link. As you will see below, I slice them in half lengthwise then about 1-inch wide. There were 17 slices of bacon in the pound of bacon I purchased so it was pretty thin which is what works the best for things like this in my opinion. 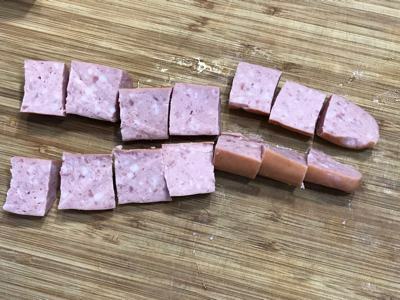 If you find a package that has at least 14 slices, cut into thirds, that will give you 42 slices together with about 3 links of kielbasa, will give you 42 of these appetizers. 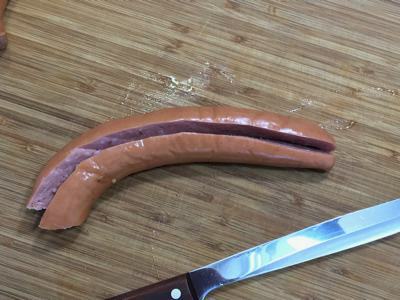 Place a link of kielbasa on the cutting board and with a sharp knife split it in half lengthwise. Then, while holding the halves together, further cut it into 1-inch pieces. 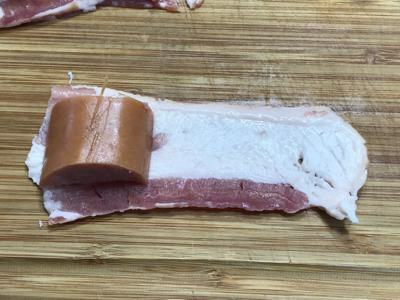 Lay a piece of bacon on the cutting board with a piece of the kielbasa at the edge of a piece of bacon. Sprinkle some of my amazing original rub (get the recipes here) on to the bacon and the sausage. 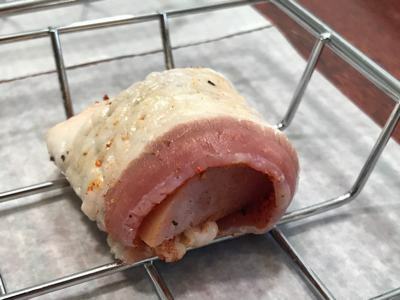 Wrap the piece of bacon around the piece of sausage and place the wrapped sausage on a Bradley rack, Weber grill pan or whatever you are using to carry the appetizers out to the smoker. Let them sit there get happy while you go get the smoker going. This is a great recipe for almost any smoker or grill as long as you can maintain a good smoking temperature and provide some smoke. Over the last year or two I have become extremely partial to pellet grills as they are just so versatile, easy to use and it's really nice knowing that you are cooking over real wood! I particularly enjoy using the Camp Chef Woodwind as it has some extra features that many of the others at the same price point do not have such as easy ash cleanout, hopper cleanout chute, and the optional sear box which can reach temperatures as high as 900°F when you really need to put a sear on something. 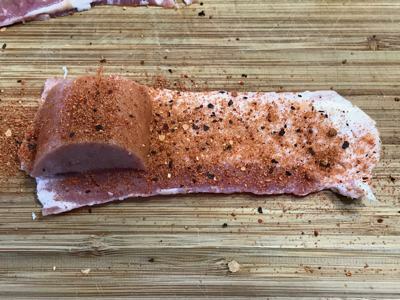 Regardless of the smoker or grill you are using, maintain about 240°F for approximately 1.5 hours or until the bacon gets nice and brown and has a good “bitethrough” to it. I recommend making the glaze while the appetizers are in the smoker cooking. Place 1 cup of brown sugar into a small to medium size pan. Add ¼ cup of beer and 1 tsp of red pepper flakes for some heat. Use low to medium heat so the brown sugar will melt and the red pepper flakes will leach a little heat into the mixture. It's ok for it to simmer lightly but it should not boil. About 15 minutes should be plenty of time for this process. Making this ahead of time will allow more of the red pepper flake heat to get into the glaze. When the apps are almost done, you can brush on the beer and brown sugar glaze to give them an extra layer of flavor. It does not hurt to brush them a couple of times with about 10 minutes between each to allow the glaze to set. Serve these appetizers just as soon as they get done and watch peoples eyes roll back in their heads as they taste them. I recommend serving these right out of the smoker however when I brought these home, they had been in the fridge for a few hours and were cold. Folks were grabbing them and eating them cold and still commenting on how good they were. Things like this work great for when you are serving dinner late and guests arrive early. Don't be fooled by the simplicity of these bacon wrapped kielbasa smoked perfectly and then lovingly glazed with a mixture of brown sugar and beer with pepper flake heat. Pop a few in your mouth and you'll say wow! 1 lb of bacon cut into thirds. Lay a link of kielbasa on the cutting board and slice it in half lengthwise. Then, while holding the strips together, cut it into 1-inch pieces. 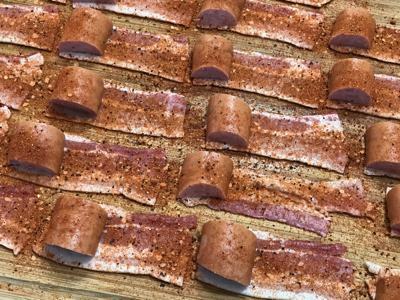 Lay a piece of kielbasa on the ends of a strip of bacon, season it with Jeff's original rub and then wrap the bacon around the piece of kielbasa. When you are finished wrapping all the pieces and they are on a Bradley rack, Weber grill pan or whatever you are going to use to transport them to the smoker, sprinkle them generously with more of the original rub. Smoke the appetizers for about 1.5 hours or until they are sufficiently browned and the bacon has a good "bitethrough". While the apps are cooking, place 1 cup of brown sugar, ¼ cup of beer and 1 teaspoon into a small to medium sized pan over low to medium low heat. Let the mixture simmer lightly for about 10 to 15 minutes. When the appetizers are almost finished cooking, brush the glaze onto the pieces a couple of times. Let it set for about 10 minutes before adding a new coat. When they are completely done, remove from the smoker and serve immediately. I had quite a few cut pieces of bacon after making these, so I put your rub on them and cooked them in the microwave for about 2 1/2 minutes. OH MY! They were delicious!!!!! I made these the other day and came out pretty good, but next time I’m going to try using organic uncured bacon that is not as salty. Between the kielbasa and the bacon the sugar didn’t counter the saltiness of the meat. These were awesome! I made them on st paddy’s day while we were waiting for the corned beef to cooked! They were a real crowd pleaser! I will Definitely be doing these again! Thank you Jeff for your continued support! 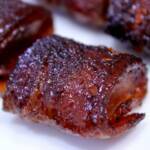 Do you think the Bacon Wrapped Keilbasa would carry over after cooking for a party if they were reheated in the oven? Hey Jeff. I noticed that you didn’t use toothpicks. Do they stay together enough without using them? Thanks! 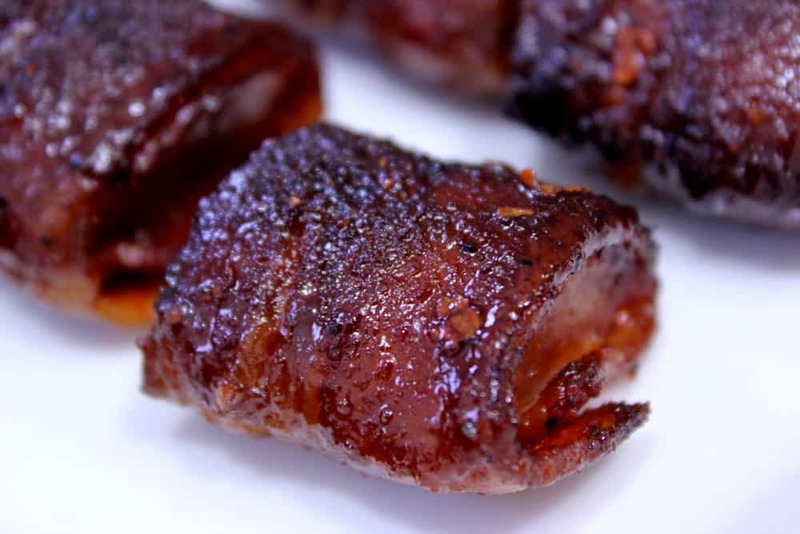 I have all but stopped using toothpicks for most of my bacon wrapped items.. the bacon tends to stick to itself pretty well and I have not had any issues with it coming unwrapped. These are no exception.. I tried to make sure the wrap stopped on the bottom but it stuck well and did not unwrap at all.